Chalon-sur-Sâone is in the Sâone-et-Loire department of central Burgundy, between Dijon and Mâcon. 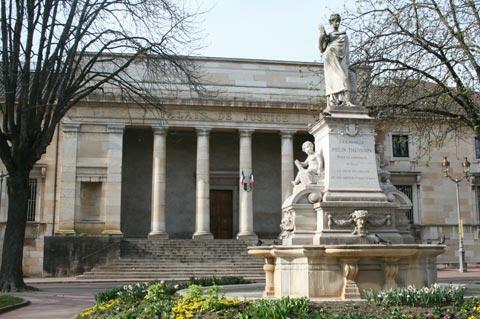 An interesting stop-off point as you head south towards Lyon, the town has a pleasant centre with medieval houses and a cathedral that merits exploration. 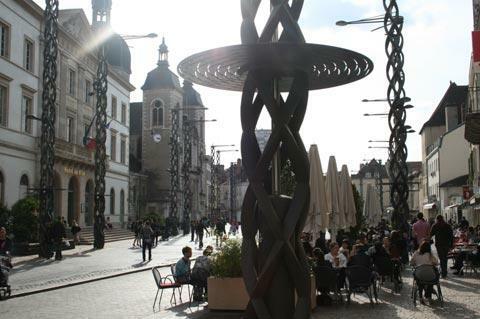 Start your visit in the large open square in front of the Town Hall (the Place de l'Hôtel de Ville) where you can see various buildings of interest: among the notable buildings in this square are the town hall, the large Church of Saint-Pierre, and the Museum Denon. 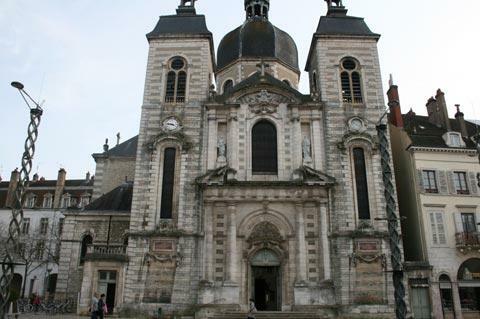 The Church of Saint-Pierre is interesting for its imposing baroque style facade. Another imposing religious monument in Chalon-sur-Saone is the Cathedral Saint-Vincent in the Place du Marché, originally the centre of the medieval city. Dating in part from the 11th century the facade of the cathedral was added in the 19th century. Inside the cathedral you can see some ornate stone arches, medieval frescoes and cloisters. 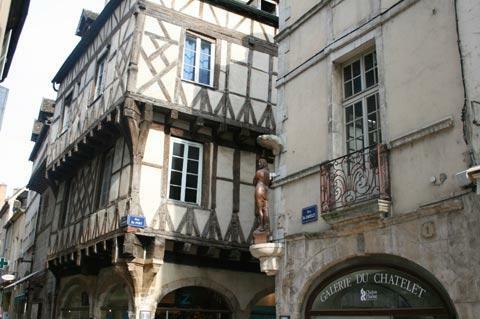 There are also some attractive half-timbered houses to be seen around the edges of the Place du Marché: a good opportunity to sit in the sunshine at a street-side cafe watching the world go by. Around this square you can explore the large and mostly pedestrianised centre of Chalon-sur-Saone with the old streets containing a very wide range of shops and cafes, and some individual properties of interest such as one or two medieval half-timbered houses, the Palais de Justice and others tucked away up side-streets. One of the inventors of photography, Nicéphore-Niepce, is from Chalon-sur-Saone and in his honour the Museum Nicéphore-Niepce has amassed various cameras and paraphernalia relating to the early days of photography, along with many examples of later photographic equipment and photographs. 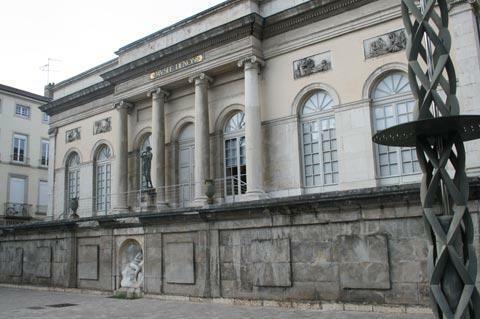 A second museum in Chalon-sur-Sâone is the Denon Museum, dedicated to local history and traditions and situated in an imposing classical style building on the Place de l'Hôtel-de-Ville. 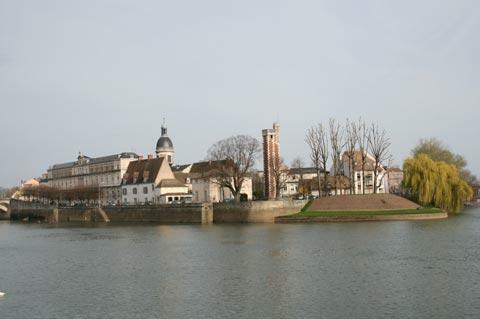 After exploring the centre of the town you can stroll down to the banks of the Saone to look across the river. 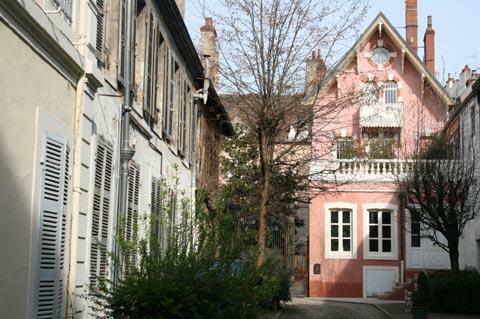 Chalon-sur-Saone also prides itself on its carnivals and outdoor festivals, which include a large carnival in February and a festival of street artists held during July each year - if possible try to time your visit to coincide with one of these events. No visit to Burgundy would be complete without wine-tasting, which you can do in Chalon-sur-Saone itself at the Maison des Vins, who have a large selection of carefully selected local wines to taste (and buy). 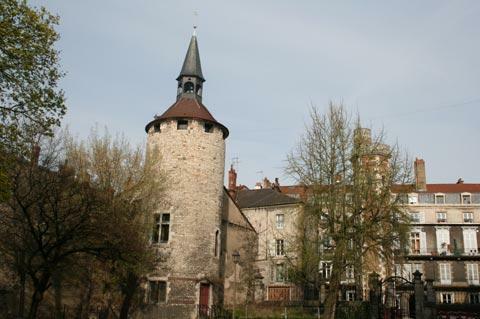 To the north of Chalon-sur-Saone you can visit Beaune to see the remarkable medieval hospital, and to the south you can visit Tournus to see the imposing 11th century abbey church.